It is not a bad idea, I just doubt that it would have played out to prevent any of the past shootings. Family members often fail to see or realistically assess the danger. Still, would be good if family members that do appreciate the danger could take action and I could also advocate this being broadened to mental health professionals - they should be able to take these actions for their patients. Could also support raising the purchase age to 21, given the fact that a lot of mental maturing still happens between 18 and 21 (and for especially for guys still continue much longer). One of the biggest problems is mental health is still such a touchy subject. I take Zoloft every day and don’t mind telling people I do. Since taking it, I feel normal like I didn’t feel for about 10 years. A good mental health expert will help people figure out if meds or behavior management is appropriate. I think it might be wise for doctors to require regular checkups and report people who miss appointments or don’t get prescriptions refilled. I know you get into HIPAA, but in this area, it might be necessary. The other thing is that the vast vast majority of people being treated for menta health issues are not dangerous, even without the treatment. I agree with you. Many people get the same benefit from exercise as I do from Zoloft. I do both. If the police and FBI had done their job, 17 kids would still be alive. I am still not sure what they could have done about it. If they had perhaps just paid him a "visit" he might have thought twice about it, but probably not. A restraining order would have been about as useful as the law saying murder was illegal unless someone was watching him every second of the day. If he didn't have a gun he might have been driving across the crowded campus sidewalks before classes or making a bomb to put in the cafeteria or God knows what else. In North Korea or China they can handle this kind of thing expeditiously. In the USA, we have freedoms that can be exploited by deranged people and unless we are willing to allow a police state, I don't know how you would stop this kind of thing. I would think a public execution would likely be the only kind of thing that would deter someone like this, because if they are unable to sympathize with their victims, perhaps they will have sympathy on themselves when they envision themselves at the end of the rope. It would also help if the media wouldn’t advertise the killers’ names and show their pictures. Some of these are copycat inspired mass killings and in some cases the killer fetishizes earlier mass shooters. Hum....very true. But are you really just upset the pictures of all whites killed didn't match your earlier racist, and white supremacist comments made about the killer? Some idiot, Rankin is his last name, has been arrested, in Shreveport I think it is, for posting a picture of an "assault rifle" on Facebook with the caption: guess it's time for me to go back to school. The local police notified the FBI and together, supported by helicopter gunships and a B52 strike, they busted down his door, seized all his guns and he is now being held without bail. I don't support what he posted on FB....even though there is that pesky 1st Amendment thingy...but, is it a crime for being stupid? If so, we have to arrest all the libtards. IF, and I say "IF," all he is guilty of is posting a distasteful, truly stupid post on FB then the authorities have over-reacted and I say Rankin can bring charges against them, and a civil suit. 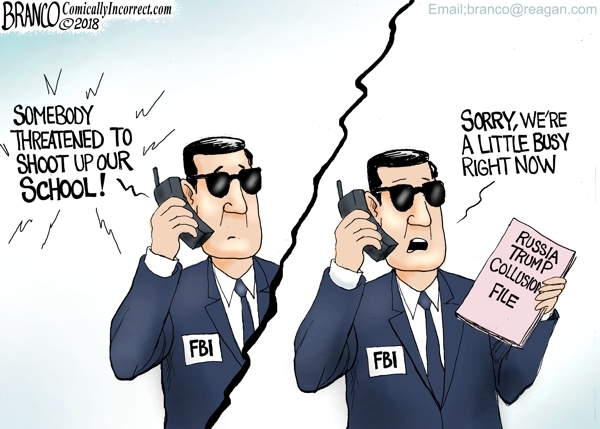 Yeah, in the wake of one failure after another the goofy FBI is now trying to save face. BTW, they did not find the rifle in the picture or another such rifle. They only found, and confiscated, regular shotguns and a deer rifle. Maybe there is more to this story than just what has been reported and this Rankin guy is a bad dude, etc... but, if he's just your average guy who made a bad choice by posting a distasteful post on FB, then he has legal recourse.